Pets love having their own, pet controlled door that they don't have to push open. Pet owners love the Power Pet door too because they are relieved from "doggy doorman duty"! Performance, convenience, energy efficiency, security and reliability. Featured on HGTV, the Power Pet Door is one of the most useful inventions for pets and for the people they own. The doors are motorized to operate like a power car window (only much faster). The door is pet controlled by a directional, ultrasonic collar that lets your pet come and go safely and securely while completely freeing you from doorman duty. The PX-1 (Medium) door is intended for pets up to 30 pounds. For larger pets, see the PX-2 (Large) Power Pet door. Training is easy and most dogs and cats learn to use their Power Pet door with no actual training at all. With ULTRASONIC SENSING, the door opens automatically when your pet is on direct approach. However, it will not open when pets may be just wandering by, sitting, or sleeping next to the door. The 4-way access control lets you set the door to "in only", "out only", "in and out" or "closed and locked". And the metal dead-bolt lock is essentially impossible to force open. Only the pet collar or a secure manual button can open a Power Pet door. Other "automatic" pet doors are not truly "motorized". Others use a hard-swinging flap that unlocks when your pet is near. These still require your pet to push open the flap (something many dogs and cats avoid). An automatic safety retract feature stops and retracts the door if it senses an obstruction during closure. And you can set the distance that the pet must be for the door to open. The outside and inside distances can be adjusted independently (it's usually more convenient to give your pet more opening distance when approaching from outside than inside). 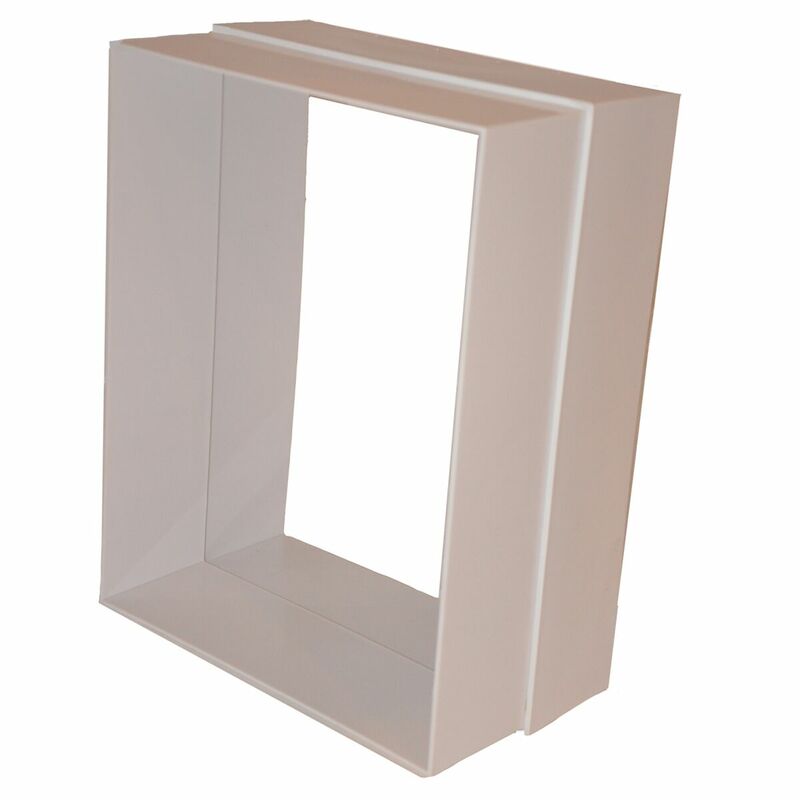 Power Pet doors are extremely thin (less than 2 inches), which allows it to be mounted flush to your door or wall. You cut a hole only as large as the door panel itself, then mount your POWER PET door in front of the opening - extremely quick and easy ot install. And it can be installed in doors or walls (with purchase of optional wall tunnels). 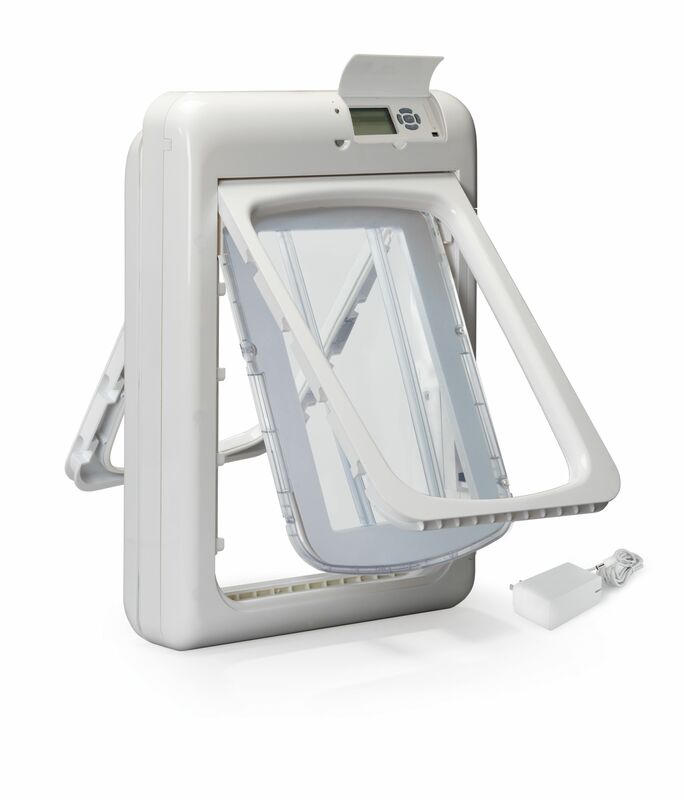 The PX is constructed of an ultra-high strength ABS composite housing with a bullet-proof Lexan plastic door panel, giving you and your pet the ultimate in security. The Lexan panel is mounted on a sliding, air-tight seal. Because the Power Pet doors are hermetically sealed and completely wind proof, you'll have the best insulation, wind, rain, and foul weather protection of any pet door made. The included MS-4 ultrasonic collar is water resistant and is perfect for most pets. This collar will work in rain and snow without fail. However, if your pet loves to swim and you have water on your property, you may wish to purchase the optional MS-5 waterPROOF collar. The MS-4 and MS-5 operate on a custom, long-life lithium battery that normally operates the collar for 3 months or more. The door itself operates using the included AC wall adapter. However, the optional CRG-12V-2B kit includes a charger and 2 rechargeable batteries. This kit allows you to conveniently operate your Power Pet door without ever plugging it into the wall. Use one battery to power your door and keep the other in the charger. When the door battery runs low, just swap it out. The Power Pet doors are also compatible with High Tech Pet's X-10 containment system. If your pet is wearing their HTP containment collar, then it will also operate the Power Pet doors (no extra/separate collar required). This absolutely state-of-the-art design represents the most advanced, most reliable, most stylish pet door made! Unit Width: 12"; Unit Height: 28-5/8"; Depth: 2"
Pet Opening Width: 8-1/4"; Pet Opening Height: 10"
Everything you need for a quick, easy and professional looking installation in a household door. This product was added to our catalog on Monday 15 August 2016.